Wayne & Linda Hetzler started a band in March of 1976 and a marriage in Dec. of the same year. 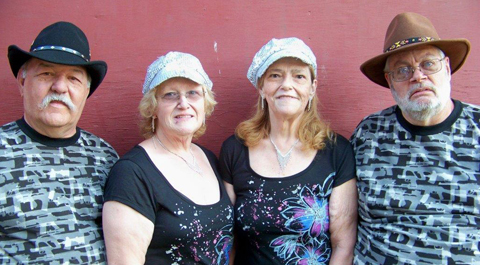 “Tender Lovin’ Country” performed as a group for the next 25 years throughout the tri state area and have opened for many Nashville acts. They served as staff band at Country Paradise Park during the late 70’s and early 80’s. From 2000-2006 Wayne & Linda toured the east coast campground circuit with a clown group called “Clown-n-Around” doing music, skits, magic, and balloon sculpture to the delight of children and adults alike. Bluegrass has always played a big role in this group as Wayne is proficient on banjo, mandolin, fiddle, and guitar and Linda on bass. As recent trends in country music have gone down a “different” path, the Hetzlers with ” Keep Off the Grass” are embracing bluegrass and gospel music. Other members of the group include Tom McGarrity from Fairview on acoustic guitar and Julia Chorle of Hilliards, PA. Tom was part of the original group in ’76 and Julia, who is Linda’s sister, brings a new dimension to the group with her tremendous harmonies and lead vocals. The bluegrass community is a huge family that “Keep Off the Grass” is proud to be a part of. This entry was posted in Danna's Radio Diner Archive and tagged Banjo, bass, Bluegrass Music, Country Music, guitar, Harmony, ice jam, mandolin, Patsy Cline. Bookmark the permalink.